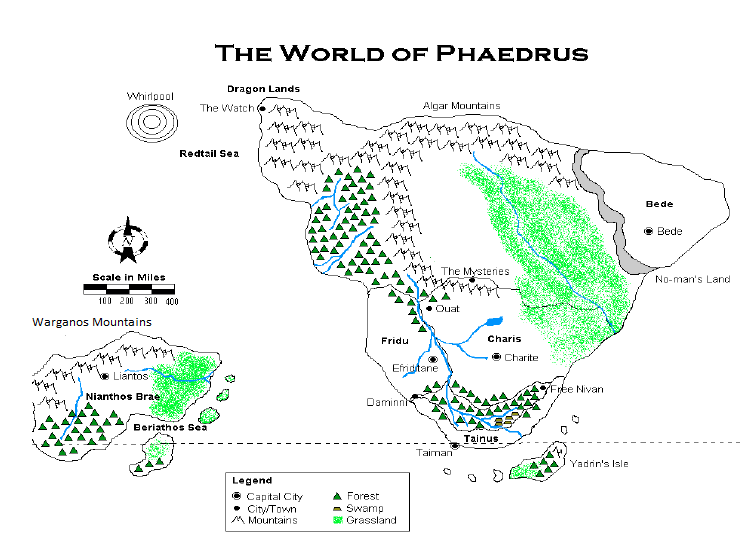 Nils over at Enderra has taken on the January 2015 RPG Blog Carnival with a great topic… A New Year, A New World. How do you run an exploratory campaign? What techniques do you use to create your worlds? Who is doing the exploring? Tons of great open-ended questions to inspire writers like yours truly to come up with some great stuff. And in this case, I’m going to explore a world I created a long time ago that I’m hoping to resurrect more this year. In a sandbox-style world like I usually run, I often find myself creating the world alongside the players. That way I don’t get too far ahead of the PCs and am not detailing corners of the universe that they may never actually reach. Even so, I like to have some broad strokes figured out to kind of guide my thinking before the PCs get there. Most of the time that means creating some very general world maps. I’m a horrible artist, so I won’t torture you with my early drawings – just the image I created in Microsoft Paint in the mid 1990s. I had some rough descriptions of the areas, drew them on paper and translated that to Paint. What’s funny to me is that it’s not even a full world – I have no idea what’s below the equator and this maybe represents only a third of the globe so far. So I left myself plenty of space to grow as needed. The elves a bit of a secretive race stashed away in their own private tropical island kingdom (there are three kinds of elves, including a seafaring variety). The dwarves are locked away in the mountains to the north, perhaps influenced by the extraplanar dragons just west of them. The dragons circle the whirlpool, which predates the wormhole from Guillermo Del Toro’s Pacific Rim by a long while, but operates in a similar fashion. The gnomes are everywhere in a magical, invisible kingdom. The fae are in a parallel dimension and pop in to cause trouble whenever they wish. And humans exist in the space between north and south. Oh, and there’s an entire kingdom of the undead to the northeast. Can’t forget that. Really this world is one of the favorites I created simply because it has such a wide-open vista to explore. Though I have based only a couple of campaigns in this world over the last 20 years, I did manage to do both entirely in human lands. That allowed me to introduce the other races a bit at a time – sort of Tolkienesque. In the world of humans, the elves were largely myths unless you lived somewhere near the southwestern coast. The dwarves were even more distant unless you live to the north. The dragons are all but forgotten unless you’re the dwarves or the elves exploring near the whirlpool. And the the Kingdom of the Dead isn’t a problem for anybody but the nomads in the big open spaces. However, if you live in the middle space, the gnomes are in all the major cities and the fae are known troublemakers everywhere. Humans here are like the hobbits of Middle-Earth. They live in their own worlds, expanding a little at a time until they cause trouble for the other races making them perfect for introducing gamers new to this setting. By making the other races largely mythological, I can play with introducing them gradually as the humans kick the hornet’s nests. And, as the sandbox guy I am, I can put off detailing a TON of things beyond the broad strokes until I need them. 🙂 No matter where I put the PCs, I have tons of freedom – and so do they. And we can then go wherever we want together. Looking for other RPG Blog Carnival topics? Check out the archive over at Roleplaying Tips!